Valton was born in Paris and studied there at the École des Beaux-Arts and with Félix Fossey. 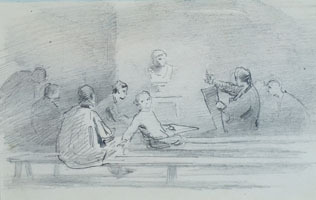 As evidenced by this drawing, he must have also studied, or perhaps taught, at the Association Polytechnique on the rue Picardie in the 3rd Arrondissement of Paris. He was a painter of landscapes and genre scenes, and his work is found in several provincial museums in France, including those in Grey, where he is represented by a painting entitled Les Halles de Paris, and in Longwy which has his painting La Moisson (The Harvest). Valton was also as an illustrator. In 1869, Histoire des Premiers Siècles du Christianisme by F. Grimont was published in Paris with woodcuts after drawings by Valton. 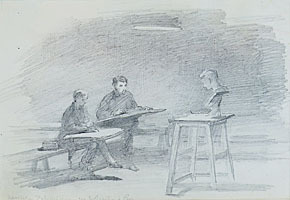 One of a series of pencil drawings by Valton of classes at the Association Polytechnique.